Would you like to investigate what daily life was like in the early Roman empire? Have you read novels about the last days of Pompeii and want to know more? Would you like to walk the streets of this ancient city with experts who know its history, and not as a fleeting tourist? 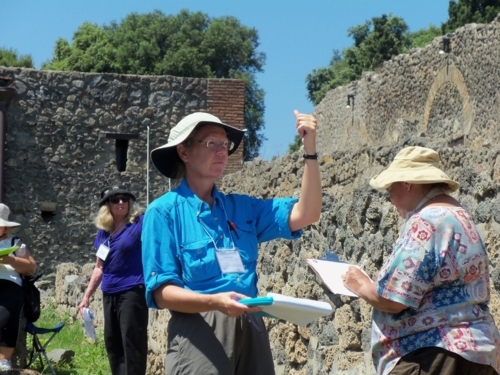 The Pompeii Food and Drink Project offers an unequaled opportunity to explore the ancient Roman city of Pompeii, Italy, as a research participant in an ongoing noninvasive (that means no digging) study with a staff of historians, architects, and classicists. Thanks to Supt. Massimo Osanna, Director Grete Stefani, and the Great Pompeii Project there are very exciting places to see and analyze in the ancient city this season. Some examples are: the magnificent Championnet complex with its marvelous kitchen. The project analyzed and documented large parts of the elite mansion. This “sloping house” over four stories high has 60 rooms. The House of the Sailor is an elegant home with a great view and a totally developed underground area for commercial bread making and baking. Soon to be reopened are the House of the Library, House of the Golden Bracelet, and the House of Fabius Rufus (which we see daily from a distance on our walk to work in the scavi). Maybe best of all will be the excavation of an entire untouched city block in Region IX. Wait, there is excitement in Region V, too. An archaeological intervention has stabilized the ancient walls between the House of the Silver Wedding and the House of Marcus Lucretius Fronto. In this alley area, we see houses with second floor balconies. These balconies would be good place for outdoor dining. Would you like to see a twenty minute video about our Project filmed in Pompeii? If so, please check out –The Pompeii Food and Drink Project on Vimeo. Vimeo.com/216050148. Read about our beautiful accommodations at Villa dei Misteri. 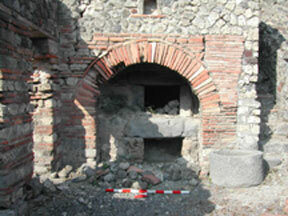 The hotel takes its name from the ruins of an ancient Pompeian villa located on the same street. The villa is known for a fresco portraying the initiation rites (or "mysteries") of the Dionysian cult. In 79 C.E., an eruption of the volcano Mount Vesuvius buried the thriving 600-year-old Roman city of Pompeii and surrounding villas with 20 feet of pumice, volcanic ash, and other pyroclastic materials. The city remained almost forgotten until 250 years ago, when excavations began to uncover many buildings and their contents that were preserved in a remarkable manner. Within the wall of this 157 acre city are houses, shops, temples, baths, markets, and sidewalks that attest to Pompeii's social and economic vibrancy. While early discoveries focused on public buildings, temples, theaters, and lifestyles of the affluent, modern scholars have become more interested in down-to-earth topics. Wilhelmina Jashemski excavated and documented all the gardens and plant life of the ancient city. Her students include the Principal Researchers of our Pompeii Food and Drink Project and they have continued her approach. Betty Jo Mayeske has concentrated on Pompeian bakeries; and Robert Curtis are experts on all aspects of garum manufacture and trade. To identify rooms and spaces associated with food and drink in the following structural categories: Domestic, Commercial, Public, Religious, Cemeteries, and Other. Over 1435 structures will be examined. To document the rooms, spaces, and features of structures in all categories, by measurements, sketches, and photographs. See a graphical summary of our activities from 2001-2012. To organize and preserve the massive amount of collected information so that it can be analyzed and be made available to others. A comprehensive electronic database, Food and Drink in Ancient Pompeii Codex, includes the structure address, floor plans, features shown in original drawings, video, and digital, color, black/white photographs. A printed guide will also be prepared. See our online demonstration of the database here. To determine the spatial relationships of structures to one another, and the patterns of daily life, by using a Geographic Information System (GIS). To present city-planning lessons learned from the analysis of ancient Pompeii about building an enduring and healthy urban environment in the 21st century. The historical context of Pompeii remains unique and permits an analysis of daily Roman life of great scope, complexity, and variety. In particular, there are many questions to be answered about food and drink production, storage, preparation and consumption. Pompeii is protected and well cared for, but is under stress from pollution, weather, fire hazards, vandalism and the more than three million tourists who visit each year. 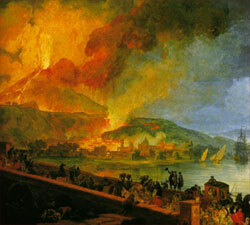 Vesuvius remains an active volcano; earthquakes are not uncommon. Recognizing these concerns, we realize that our work site is amazing and special, and that we have developed research teams who are skilled at analyzing and documenting food and drink structures and features. At this stage, we need to consider both old and new undertakings. First and foremost, the Pompeii Food and Drink Project will finalize its current research plan of studying and documenting an entire ancient city. We have analyzed and documented 881 structures and 4,585 features associated with food and drink. In addition, our past work will need to be updated because of new discoveries, and restored structures (this brings change). It is time to test our research model in other cities. Herculaneum, for one, could be analyzed with respect to structural patterns of living associated with food and drink. It may present a totally unique overview with unusual patterns of living. Outside of Pompeii we should analyze and document wealthy and working villas, religious remains, and commercial structures to enhance our knowledge of the role of food and drink in the Campanian area. In addition, since so many of us are teachers, we should organize and present what we have learned working in Pompeii to analyze the food and drink economy with a specific research model. You can help us achieve our old and new research goals as a volunteer/team member or support our work as a sponsor. Register now for the 2018 season. Copyright ©2018 Pompeii-Food-and-Drink.org. All rights reserved.